Add sophistication to your home with this Oh. Home Flokati rug. Its natural color allows for easy integration into your current home decor, while its plush appearance helps to bring a warm, cozy feeling to your room. 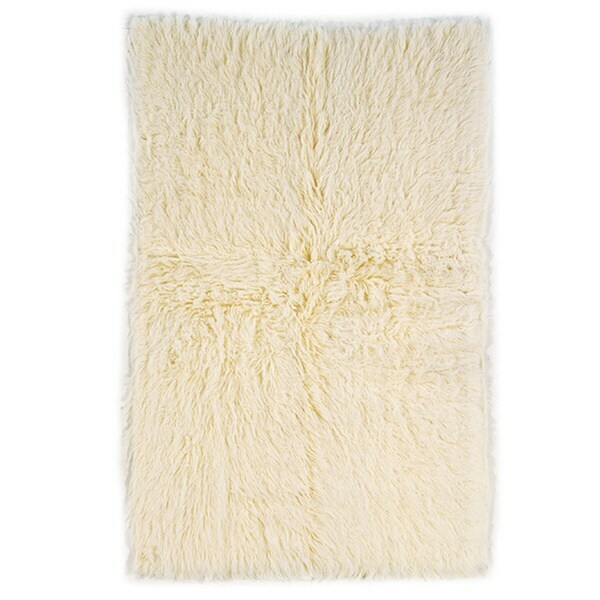 This rug is the perfect size to act as an accent piece in front of your couch, beside your bed or at the base of stairs. I love this rug. Be warned if you are looking for a heavy backed rug, the type that ships rolled up this is not for you. The back of this is almost like a shawl material which makes the rug much easier to shake out for fluffing and removing debris. It also makes it fit easily into a washing machine. Since I bought white, that was important to me. Don't be alarmed when it comes out of the box. Just shake it like it owes you money and it will fluff right up. I was very disappointed in this natural colored Flokati. It is not very think and you can see down to the backing where the fiber are woven in. I bought the exact same one in dark blue and pink colors and I was impressed in the quality. I don't understand why there is such a huge difference in the quality of these rugs. I will be returning it and exchanging it out for a different colors in hopes that it is better quality. Looks great in my living room. I always wanted a flokati rug and now I got it. It was a very good price, good size and great quality. This rug is laying over my carpet in my living room and it does not travel as it sometimes happens with rug over carpet placement. It is very cozy and it looks great! You get what you pay for. This is a very low price for this type of rug. It's small, and the quality isn't top notch. It's not particularly soft, but not rough. Kind of matted. I vacuumed it with the hand held brush attachment and that helped quite a bit. It is thin, but not ridiculously so. I wanted it to put under a chair in a reading area of large room that has a patterned rug that is too small to fill up the room. I'm on a budget decorating a house that needs a lot of work. So it will work for my needs, for now until I can get a bigger patterned rug for whole room. My teenager loves it. Husband thinks it looks like a dead animal. It's what I expected and for the price, I'm ok with it for now. It's a fine rug, but is 3.5 x 5.5 not 4x6. I am still ping because this needs to be 50 characters. I love this flokati rug -- it's comfy and elegant! It does shed some but easy to handle. I also have the extreme version of this rug and this one is not as great. It's okay; for the price I can't really complain. I bought this to cut up and use as basket stuffers for my newborn photography. I think it'll work well for the purpose. DO NOT BUY THIS RUG! It isn't worth the cost to ship it. As soon as I took it out of the box clumps of wool began to fall. You can also see the plastic backing straight through the floor because the rug is so thin. Super low quality and VERY cheap looking. Spend the extra $ to buy a nicer one. Any thing BUT HEAVY. I could read the paper through it. This thing sheds and gets dirty so fast, it's really not worth the money. Very hard to clean. I wish I had invested a bit more for something easier to take care of. Love! You can throw in machine to wash and let air dry! I wasn't expecting too much at this price point, but it's pretty low quality. Vacuuming it does nothing to get it clean. I wish I had saved to get one of higher quality. Because it is on sale. I like Flokati Heavy Natural rug! "who is the manufacturer of this rug?" Thank you for your question jenn3485. We are unable to disclose the manufacturer of some of our products; however, Overstock.com stands behind every product we sell. When necessary we can contact suppliers if a product issue arises. Thank you for shopping with us. Linon Flokati Heavy Pastel Blue Rug (4' x 6') - 3'6" x 5'6"